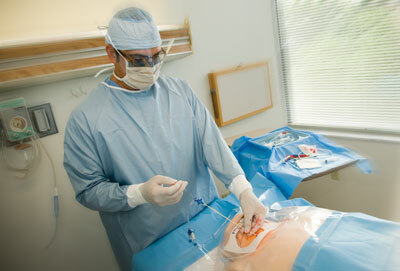 Course content focuses on proper Central Line placement, including the use of ultrasound guidance and manometry for locating and verifying venous access sites. The course includes a web based multimedia didactic emphasizing patterns of injury, site anatomy, CVC indications and alternatives, as well as complication recognition and corrective maneuvers. A hands-on practical component is then undertaken at WISER using partial task trainers to develop psychomotor skills for the placement of IJ, SC and Femoral lines. There is a strong focus on ultrasound use and sterile technique. Patient safety is emphasized at every opportunity. Cancellation Policy: It is our general policy that unless otherwise stipulated, if a participant cannot attend a class that is previously paid for, they must inform the course director by email at least 2 weeks prior to the class date for a full refund. Course director emails can be found on the directory page for each course on the WISER web site. If the cancellation occurs within 2 weeks of the class, the participant is subject to the revocation of a portion or the entire course fee to WISER. In addition, they may be subject to a cancellation fee based upon a percentage of the course cost.